In honor of International Women’s Day , here is a short list of women artists from across the globe whose music stays on repeat. By NO means is this list all-inclusive. Just a small sampling of artists that I enjoy that you should consider letting take up a bit of space on your hard drive. I have loved Alice Russell long time and I have the receipts videos to prove it. The way she sang and shook her shimmy on stage in pink tights made me a fan for life. This British powerhouse is criminally underrated, as her lane is a bit crowded. I’m hoping that her upcoming release, To Dust [read review] will finally put her on the map. It’s already one of my favorite albums of 2013. Take a look at a performance of “Hard and Strong,” one of my favorite tracks from the album. The video above is a performance at The Google a couple of years ago. I chose it because she starts to acts all the way up at the 2:30 mark and it is everything I will ever need in this life and the next. If I wasn’t so lazy busy, I would dig through my Twitter archive and find the multiple tweets I sent out raving about the Band of Brothers Vol I album featuring the sweet sounds of New Zealand songstress, Hollie Smith. It was my first introduction to the ‘Kiwi soul sister’ and I accepted my late pass because she was hardly new to the game as you will see in the video above. I cannot get enough of her voice and you won’t be able to either. Last time I blogged about the beautiful German singer-songwriter was when she joined Bilal, Tweet, and Dwele on the Dresden Soul Symphony album/DVD compilation. I have been a fan since I heard her first English language album, Born and Raised, back in 2006. Since then, she has released her third studio album, Maureen, which is entirely in her native tongue. Although I can’t understand a word of what she is singing, the album gets frequent play. After all, the language of music is universal. In the video above, she performs the title track in English. I just can’t get enough of that Kiwi soul. My soul brother from across the pond, Soul UK, introduced me to the sweet sounds of GRAMMY winner Kimbra, who recently won Record of the Year for her collaboration with Goyte on “Somebody That I Used To Know.” I can’t imagine it gets much better than receiving your award from Prince and him saying he digs the record. I mean, it just don’t seem like he digs much so it’s really an even bigger deal than the Grammy. Last year, Kimbra released her debut album, Vows, and it topped many best of lists. Enjoy this dope live performance of one of my favorites from the album, “Settle Down.” Kimbra, if you’re listening, DC awaits! I have probably been a fan of British singer Tawiah the longest of all the artists I’ve mentioned in this post. I introduced you back in 2008. You’ve had five years to catch up! I hoped we would have gotten a full length effort since the EP, In Jodi’s Bedroom. But still we wait. A ray of hope came just today in the form of a video for a single from her upcoming mixtape. Let’s hope this is a signal of good things to come. Enjoy the new video and the hauntingly beautiful acoustic performance above. Please support woman artists near and far during women’s history month and beyond. Put me on to some of your favorite international artists in the comments. Be sure to cop Ayah’s new release, 4:15, and check out her snazzy new website. After checking hard for Yazarah’s 2008 EP The Prelude, I’m ready for the main course! Check out her interview with This Is Real Music. Since this is the DJ Stylus edition of Blog Checka, I’ll also point you in the direction of the retrospective piece on his first 50 mixes posted on his site for downloading. O Bilal, Bilal, Wherefore Art Thou Bilal? I am truly slipping on my stanning duties. I saw that Bilal was going to be in Germany back in April of this year. 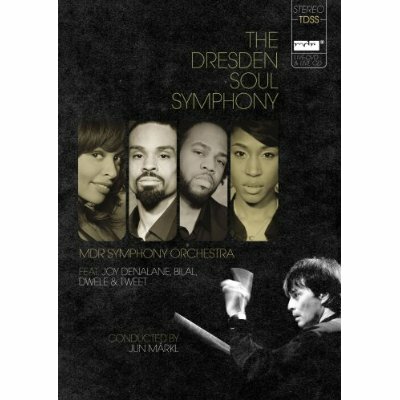 However, I had no idea that he had joined Dwele, Tweet, and underrated German female soul singer Joy Denalane for the Dresden Soul Symphony concert, where they performed classic soul hits backed by the MDR Symphony Orchestra. The CD was released on October 24th. Many thanks to my loyal reader Soul UK for hooking me up. I’ll share the love by posting a few of my favorite songs. Since re-imagining classic soul songs seems to be the “thing” lately (Kenny Lattimore’s Timeless and Seal’s Soul are recent examples) I am learning to try and not compare them to the original. Let me know what you think of what these artists did with these songs in the comments. Or are you over albums covering soul classics? I think you at the very least have to admit that this is an interesting blend of talent! Once again, this is not the post I planned for today. However, this is probably a good way to round out Women’s History Month. Normally, I would give ya’ll some rudimentary collage of pictures and some videos. I just don’t have it in me today. I am coming down with a case of the nasties and I can tell it’s going to be a bad one if I don’t nip it in the bud. I don’t even know if getting that ‘Tussin down in it is going to work. Ya’ll pray that it does. A sista is on the move. I got a date with Sy Smith tomorrow night and will be up in NYC this weekend enjoying Cat on a Hot Tin Roof. The show has got to go on. I came up with the idea for this post while riding home today, berating myself for the fleeting thought I had last week that it would be “nice” if I got sick again like I did a couple of years ago when I lost 12lbs in three days. I couldn’t hold anythingon my stomach, not even water. Folks, be very careful what you let enter your mind. Lizz Fields’ excellent album, By Day, By Nightwas caressing my ears and I got to thinking about how I wish I could hear more of the soul sistas (and brothers) with true talent on the radio instead of the bs they play fifty eleven times a day. I don’t have the energy for that rant. Anyhow, here’s a list of female soul singers that I enjoy. Not an exhaustive list BY ANY MEANS. It’s just what I captured from the ‘pod and my Myspace friends list. I didn’t even go through my cd’s. We would have been here all night! If you haven’t already, get into these artists. Purchase their albums. Support real music. Again, this is not the list. It’s my list and it’s not exhaustive, by any means. Please feel free to add your favorite underrated female soul singers in the comments. I am always looking for new inspiration. Look out for more posts using songs from artists like these.